Daily Prompt: This is clearly subjective, but some words really sound like the thing they describe (personal favorites: puffin; bulbous; fidgeting). Do you have an example of such a word (or, alternatively, of a word that sounds like the exact opposite of what it refers to)? What do you think creates this effect? 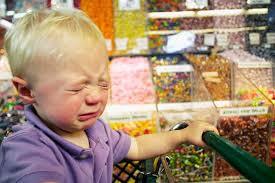 In the supermarket, little Dimitri wants to buy something his mom won’t give him. He has a melt down right there and then. He’s frustrated mom makes an angled chopping motion with her hand, and steps back looking at him incredulously. She stamps her foot back, and yells, “Mi Grinaizee, Dimitri!” (Don’t whine, Dimitri). “Den Grinaizo!” (I’m not whining…), he complains back, sounding more whiny then ever. How can a word which starts with “grin” sound so whiny? Yet it does. At least to me. I think its the way its delivered with a long frustrated “yaaa zeee”. So moany!